RALEIGH, N.C. — Civil rights groups will hold listening tours of poverty-stricken areas in North Carolina’s rural counties and inner city neighborhoods. 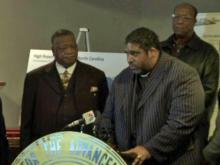 The National Association for the Advancement of Colored People, the N.C. Center on Poverty, Work and Opportunity and the N.C. Justice Center held a news conference Tuesday about the bus tours, then walked to the First Baptist Church across the street for a prayer vigil. About 18 percent of North Carolinians are living at the poverty level, which is $22,000-a-year for a family of four. One in four children in North Carolina lives under the poverty line. For minority children, it’s 40 percent. Civil rights groups say it’s the biggest problem no one is talking about. The first leg of what the groups are calling the truth and hope tour will be held in the northeast part of the state, with listening sessions being held Thursday in six counties – Beaufort, Edgecombe, Halifax, Hertford, Pasquotank and Washington. Town hall meetings will be Jan. 19 and 20. State NAACP President William Barber says the goal of the poverty tour is to give those people faces and voices and to force politicians to talk about the problem in this election year. “We talk about the wealthy. We talk about the middle class. But there is an eerie silence regarding the poor,” Barber said. The NAACP and other advocacy groups taking part in the tour say they’ll gather ideas and recommendations in poor communities around the state. They’ll bring those back to leaders in Raleigh later this month.